The Irvine Ice Foundation, City of Irvine, Anaheim Ducks and H&S Ventures recently opened the Great Park Ice & FivePoint Arena project at the Great Park in Irvine. The project serves as an Anaheim Ducks’ training facility as well as a community ice complex. The public ice arena is the largest in California and one of the largest in the U.S. The 13.5-acre project includes a 280,000 sf building, featuring four ice rinks with concessions, locker rooms and shops. Three of the regulation National Hockey League-sized ice sheets can seat about 500 to 600 spectators, and the fourth – known as the FivePoint Arena – is an Olympic-sized venue that seats 2,500 people. The Great Park Ice & FivePoint Arena is the largest facility of its kind in California and one of the largest in the U.S. The project includes a 6.4-acre building featuring four ice rinks with seating for to up to 2,500 spectators, concessions, locker rooms and shops. Site work included surface parking, landscaping and entertainment areas on a 13.5-acre site at the Orange County Great Park in Irvine. The Great Park Ice & FivePoint Arena is the result of a successful collaboration between the Irvine Ice Foundation, City of Irvine, Anaheim Ducks, Irvine Ranch Water District, and H&S Ventures. Fuscoe Engineering provided civil engineering design and construction documents for this expansive sports facility. Although the site appears flat, in fact, it has a vertical difference of over twenty feet from end to end. With a very large, flat building covering over six acres of land, this elevation difference presented site grading challenges that were successfully dealt with through creative solutions, while still maintaining an earthwork balance between cut and fill. The Great Park Ice & FivePoint Arena is the largest facility of its kind in California and one of the largest in the U.S. 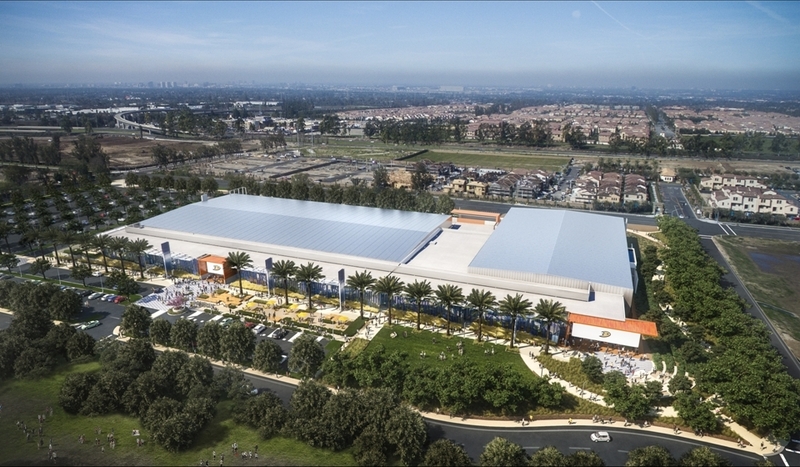 The project serves as an Anaheim Ducks’ training facility as well as a community ice complex.The 13.5-acre project includes a 280,000 sf building featuring four ice rinks, concessions, locker rooms and shops. Three of the regulation National Hockey League-sized ice sheets seats about 500 to 600 spectators and the fourth, an Olympic-sized venue, seats 2,500 people. The Irvine Ice Foundation, City of Irvine, Anaheim Ducks and H&S Ventures recently opened the Great Park Ice & FivePoint Arena project at the Great Park in Irvine. The Great Park Ice & FivePoint Arena is the largest facility of its kind in California and one of the largest in the U.S. The project serves as an Anaheim Ducks’ training facility as well as a community ice complex. The 13.5-acre project includes a 280,000 sf building featuring four ice rinks, concessions, locker rooms and shops. Three of the regulation National Hockey League-sized ice sheets seats about 500 to 600 spectators and the fourth, an Olympic-sized venue, seats 2,500 people. Site work included surface parking, landscaping and entertainment areas. The Great Park Ice & FivePoint Arena is the result of a successful collaboration between the Irvine Ice Foundation, City of Irvine, Anaheim Ducks, Irvine Ranch Water District, H&S Ventures. Fuscoe Engineering provided civil engineering design and construction documents for this impressive facility. Although the site appears flat, in fact, it has a vertical difference of over twenty feet from end to end. With a very large, flat building covering over six acres of land, this elevation difference presented site grading challenges that were successfully dealt with through creative solutions, while still maintaining an earthwork balance between cut and fill.